Yvonne sat down with Sarah Campbell, of Intrigue Teaches, to chat all about wedding sales and marketing strategies to increase budgets and expand your portfolio. Be sure to watch until the end for a special promo as well! This was a great episode that you don't want to miss! start: Intrigue is known for large scale designs and over the top weddings. I didn't start with this caliber of a wedding. The desire to produce high-end events pushed me to change my marketing strategies. What are your thoughts about luxury weddings - do you think all designers have the opportunity to do these types of events no matter where they are in the country? Marketing: I often hear designers say that there is no money in their market. Or they can't find weddings like Intrigue books. I am here to tell you that there is money to be found in each market. The challenge is finding it and I have a strategy! You recommend looking at your virtual footprint - can you explain that? Robin: I like to bring my own personal photographer to the set up of our weddings, but sadly, I'm starting to get many photographers that explain that they are contracted to be the exclusive photographer. It has caused some friction and makes it difficult for my branding as I want particular looks that that photographer doesn't necessarily do or focus on. Any suggestions??? This is a personal decision. I too will travel with my own photographer in some instances. This can create friction and when I do bring my photographer with me I make sure they are only shooting my designs when the contracted photographer is not present and I never have them photograph the bride or the family for any reason. My photographer's priority is solely my flowers. I find that by building relationships with my photographers in advance and referring my photographer friends as often as possible my brides get a better experience and I get images easily without having to bring my own photographer. Serena: Do you have any links for transforming Rose's into peony? - Hey everyone, it's Yvonne here. I am the Marketing Director over at Mayesh Wholesale Florist. And welcome to our February 5th Mornings with Mayesh show. This is a super special show, guys, because I have a very special guest, Sarah Campbell. And she is here to chat about wedding sales and marketing strategies to increase your budgets and expand your portfolio. Very, very exciting stuff. So, if you want to increase your wedding and event business, then be sure to stick around. Awesome. I'm gonna give you guys a few minutes to come on in. I know there's been a lot of emails that were sent out, and I just hopped on a bunch of lives trying to make sure everyone knows that we're doing this this morning. It's also an hour later than our normal scheduled show. So, thank you. I'm curious to see if you guys like it an hour later, don't like it. Send me your feedback about this. Is it crazy that we do it at 10 a.m. Eastern Time because I know it's super early for you West Coasters. So, yeah, just let me know. Good morning, Erica. Hi, Penny. Thank you for joining us again. Shelby, good morning. How is everyone doing? All right. I also wanted to make sure that you guys know if this is your first time watching on Facebook Live if you have any questions for Sarah, or for myself, go ahead and post them in the comments below and we, as long as we have enough time, will definitely get to those questions and answer them for you all. Sound good? All right, also this replay will be up on our blog in probably a day or two. So, it'll be the video replay, my show notes that we used to create this show, so that way you have something to read if you're a reader, and also our podcast replay. So, if you want to listen to this amazing show while you're driving to work, you can do that. Or, if you're walking and trying to get your steps in for the day, you can do that. So, very cool. Make sure you check out our podcast. And I also, thinking about feedback, how into podcasts are you guys? I love podcasts. I listen to a lot of different marketing and strategy type of podcasts, I know some of you guys are into this whole mystery murder type of podcast. I see those are very popular. But, let me know what you guys think about podcasts, just in general in the comments. I'd love to hear your guys' thoughts on that. And then also, of course, this show is bought to you by our Mayesh Design Star Flower Workshop Tour. Guys, we have three more dates left with Shean Strong. So, super, super excited. I don't know if you guys saw his January video. We just released it, I think, about a week or two ago and it's doing amazing. So, if you don't know who Shean is, be sure you check out that video. Be sure you go over to his Instagram 'cause he's just amazing. We love our 2019 Design Star. And so, our Workshop Tours with Shean Strong are May, we'll be heading to Nashville, August, we'll be in Austin, and then, we are gonna shoot on over and end everything for the tour in Columbus in November. So, check it out. We will post a link for that in the comments. Very cool. I also have, I believe, Desi. She is my lady behind the scenes, helping post all of our links, and helping me with the comments, and questions, and things like that. So, hi, Desi. Thanks for your help, babe. All right, guys. Oh! And last, but not least, make sure you save the date for our next scheduled show, which is February 19th. It's the Tuesday after Valentine's Day. I know a lot of you guys are gonna be exhausted. So, come on in, just wear your jammies. Grab that coffee cup. Hopefully, maybe, you might have a Mornings with Mayesh mug. And just join us for a good long chat, 'cause we have amazing questions for the next show. It's going to be amazing and so good. I love it. I feel like I say amazing a lot, yeah? All right. All right, for all of you guys that are just joining us, welcome, welcome, welcome. I am Yvonne Ashton and welcome to Mornings with Mayesh show. Today, I have Sarah Campbell here to help us learn about wedding sales and marketing strategies to increase budgets and expand your portfolio. Definitely something I think could all use and I am bring on Sarah now. There we go. Hey, Sarah, how are you? - Hi. Good, I'm so excited to be here. - I'm so excited to have you. It's finally! And we've known each other for a few years now, and so, I don't know why we haven't done this earlier. But I'm glad that we're finally here. - And so, how are you doing today? - Oh, wonderful. We've been doing so much travel this year, well, last year, that this year, new year, it feels so nice to be here in Maryland and just having some quieter, calmer times. Really nice. Which is probably why we have time to do this. - Yes, you have been one busy lady. And guys, just in case you don't know about our guest, I'm sure, I'm hoping a lot of you guys already do, but just in case. Sarah's really known for her wedding business expertise. She's launched several successful wedding businesses in the Annapolis, Maryland region. She loves sharing her knowledge and her passion, helping her fellow designers, and she started a company called Intrigue Teaches, which is really cool. It's just all about sharing that wealth. You can catch her doing lives on Facebook and Instagram all of the time, which I really admire you for that, Sarah. And you also offer workshops and classes. So, what I'm trying to say is if you don't know Sarah, then you should. Is that a good intro, or what? - That's fabulous. You can't put it any better than that. Thank you so much. - You are amazing and you truly just inspire me cause' it does take a lot of guts just to kinda, put yourself out there, and you're putting yourself out there almost on a daily basis. So, kudos to that, and I just feel like it's something that you just get better and better at. I'm petrified of doing these kinds of things, and I do stutter. I was just doing a YouTube live just to promote this, and I totally botched it, but you know what? It's okay, mistakes happen and you learn and you just move on. So, I think for people want to get in to just live video in general, just watching you would be a really great inspiration for them. - Oh especially because I am the queen of mistakes. I make mistakes all the time. In fact, we were recording with, we have a professional videographer that records our classes for use online, and I kinda made a fumble and a mistake, she's like, oh, I'll edit that out. I'm like, no, you can leave that right there. You know, we do make mistakes. And to pretend to be perfect is no fun, right? - So laugh along with me. - I love it, I love it, I love it. So we're gonna hop on into the questions. And I think to get started, why don't you tell us a little bit more about how you started in the wedding business, and what it morphed into? - Sure, sure. So I actually started my career in the wedding industry as a wedding planner, which is something that not everyone really knows. I jumped into the wedding planning business because I love parties, and social events, and I love beautiful things. And there's a whole, long story about being thrust from planning into floral, and it definitely was not the ideal way, so it's not the way I encourage people to dive into flowers. But there came a time when I just like, I had to take on flowers, it just had to happen. And then once I got my hands in flowers and I realized that not only was it such a beautiful medium to play with on a design and artistic end, I also found that there was more revenue that I could build through flowers. So it was about 10, to 14, I'm always wrong on years. I don't know how many years. It was a lot of years ago, that I went full scale with not just doing wedding planning, but adding floral into my business. And then of course as anyone knows if you've tried to run a planning firm and a floral firm at the same time, that is a really tough balance to make. So I did have to sell off my planning firm and focus exclusively on florals. And that's when my business really started to blossom. Blossom. - I didn't say that on purpose, but it's so fitting. - That's very cool. And so what are your thoughts about luxury weddings? Do you think all designers have the opportunity to do these types of events, no matter where they are in the country? - What are some of your thoughts there? - So to really answer that, let me take you back a little bit. So when I first started getting into the wedding world, even before I touched flowers, there came to a point where I realized when I jumped into weddings, I had these big, grand dreams, over-the-top designs, luxury events. Meanwhile, I'm working in like church basements and Bingo halls, and I'm folding squeaky, metal chairs at the end of parties. That was not my dream at all. So I had tried to find some marketing education at the time. This was probably 15 plus years ago. Pre-Pinterest, Pre-Instagram, and it might have been pre-Facebook. Oh, my gosh. So there wasn't those avenues to learn that were so easy. So I went to the library, and I checked out books, right? A giant stack of every marketing, high-end advertising book I could find. I remember just loading them in the backseat of my car thinking I don't even know how I'm gonna read through these. And I studied how big companies, how large businesses marketed how they attracted luxury clients, and how they presented a luxury brand, and I started to really create the strategy for myself that I could take what these big businesses were doing, and work that into my floral, or at that time, my planning business, so that I could get into the right groups, and start connecting with those right weddings that would allow , sorry, I forgot to turn that notification off. Jordan, I might need your help. But it would allow me to really create these dream weddings. And so that really helped me a lot when I morphed into floral design a few years later. Because it gave me a springboard. Now, I had already figured out how to locate that high-end client, and then from locating the high-end client, then how to speak to that high-end client. And when I was doing the Intrigue Across America Tour last year, we taught business classes all over the country, in almost all 50 states. And consistently I would hear designers say, oh, Sarah, I love the weddings you do, but we don't have the kind of money in my state. Los Angeles even told me that. - No, here's the deal. Some of my biggest clients to date have come from some of the smallest markets in the country. There is money to be found everywhere. It's really a matter of streamlining your marketing and your advertising, and starting to attract that higher-end client. Even more than that, there's different advertising avenues you can take. Facebook is amazing right now. I know this is not a Facebook section, but we have never had a time in our careers where we've been able to say, okay, ad, I only want this ad to be shown to exactly the type of individual I want to sell you. Back in the day, we would take an ad in a magazine, right, and then cross our fingers. - But now, we have control over that. So kind of learning some of those marketing techniques is really what helps to connect with that high-end client in every single market. That was a long answer. - No, I love it. Love it so much. And I know that you recommend looking at your virtual footprint. Can you explain that a little bit? - Sure. That's definitely part of marketing. So a lot of times people say, well, I don't know if people are looking at Instagram, or they're looking at Facebook, or they're looking at Pinterest, so I'm just gonna put a little bit out there. But I will tell you, whatever you put out there, whether it be a little bit or a lot, it needs to create this, what I call the virtual footprint. Create this area that when individuals look at it, they know it's you. They can track you, they can follow you. If all of your visuals you're using are different on every, single platform, it gets a little confusing to the viewer, and it's harder for them to follow you. So this footprint should be very clear. With that, you'll see that I have the same style the same essence of my designs when I'm sharing on Facebook, and Pinterest, and on Instagram. Of course, Instagram is my favorite place to hang out. That is my favorite social media source. - Yeah. So also with that footprint is you want to continue to keep it active. So with the new algorithms that are always changing, we've done multiple studies, just within the flower world for Instagram to see what's working and what's not. And as fast as we do a study, things are changing. So one of the big changes that happened is you start seeing that if you are not sharing regularly, which is like, daily, multiple times a day, your feed'll start to get less, and less, and less attraction. That is because Instagram kinda like puts you in a time out and says, well, you know what? You're not active. Like, no one cares about you. This sounds terrible, right? So we're not gonna show everyone what you're doing. But if you're able to maintain that momentum, Facebook will continue to push your message out there. And you can see that firsthand on my feed. Like, if you go to the Intrigue feed you will see that if I'm having a downtime, or maybe I'm not working as much, you will see my numbers will really decrease, and the exposure will decrease just because I am not as active. I think it takes a lot of work, but there's so much great reward on a marketing standpoint that it's worth that time and effort. - Yeah, I obviously completely agree. That's a huge focus for my team, and I do have a marketing team, so I'm very, very lucky. But we focus a lot on content, creating really great quality content, and just making sure that we're always posting. If we're gonna have a social media page, it needs to be active. And so I'm a huge proponent of that. And being consistent. So creating content that is either educational or entertaining, or just helping awareness is just so key and important. And while it does take some time, you can create things that then, this show is a great example of that. I create this show, which is a very big piece of content, but you can then break them down into little mini ones. And so you might be able to create something really grand and big, and kind of chop it up into smaller pieces that you can kind of use on your Instagram feed, or smaller, shorter videos that can be more engaging, 'cause honestly, for everyone to sit here for a whole, entire hour is a lot to ask. And I get that. - It's a lot. It's a lot. - And also, the part that you talked about, no matter where the user is, you need them to know that it's you. And so branding is huge for us. It took a little bit, I feel like, for some people in our company to understand like, why using a certain font is so, so important. We don't want any other fonts used except for these one or two, or these colors. It's like little, nitty, gritty things, but it's very, the eye picks up on that. It might not be like so in your face, but even those small details are really important. So that way, just putting together like a quick branding guide, like this is what I want things to look like, and if it doesn't look like that, then you can like go and tweak it, so that way everyone is on the same page with those types of things I think is great. - You have done such an incredible job. I think that's why I'm so drawn to you is because I've watched your marketing. Even when I'm busy and we're not talking, like, I'm still watching. And I can see the shifts, and I can see the amount of time you put into it. And beyond that, I don't know if anyone else is as aware as I am, you have helped build this industry like nobody else. You have supported me from day one, and I appreciate that. Even when I don't think, maybe you were the only one who knew my name. It has been so incredible to have that support, and to see the way you support the floral industry as a whole, like, kudos to Mayesh and you for being able to do that, because we notice. So thank you. - Yeah, yeah, you're welcome. I feel very fortunate to work with Mayesh. And education is a huge thing for them as well. I'm lucky to have some amazing designers on my team, too, because when I kind of started in this role, I'm not like an amazing designer. I feel like I have good taste, but to create something beautiful is difficult. It takes skill. - We've slowly added those people on, and it makes a huge difference. So it definitely takes a village to do what we do, and I'm just really thankful to have an amazing team, and a company, and yeah, I love supporting people that have huge names like you, now, Sarah, and smaller names, and everyone in between, as long as we can. We're one company, so we can only do so much. But just doing things like this, I love it. So thank you. I appreciate it. All right, so what are some other marketing strategies do you suggest to attract the luxury wedding clients, Sarah? - All right, well, this kinda goes back a little bit to your footprint. You want to show off the visuals that you wanna sell. So if you really wanna sell like, these big, Intrigue-style centerpieces that just drip with flowers like I wanna sell every week, if that's what you wanna do, that's what you need to show off. You need to be showing on your feed the real things that you wanna sell. So you cannot complain that, oh my gosh, I never get clients, I want this kind of stuff if you're never showing it. Now, that doesn't mean that's the only thing that clients are gonna ask for, because if you follow my feed, you know I very rarely will show lots of greenery and lots of organic, earthy elements. Not that I don't love them, it's just not the vibe that I share. But, in 2018, every single one of the weddings that Intrigue did were loaded with greenery. So they were wonderful, they were luxury events, they were beautiful. But they were definitely a different look than what I show. So you can be showing what you wanna sell, but keep in mind that it's really a vibe, it's energy that you're giving with these images. So it does not mean that that person's gonna buy that exact thing, but it's going to allow you, by showing those luxury, high-end elements, it's going to allow you to attract that right client. I've also had a number of people say, well, I don't wanna show too much luxury, high-end images, because then my clients will think they can't afford me. Well, I got news for you. Pretty much everyone will think they can't afford you anyway when you're showing pretty things, so don't even worry about that. And it is good to filter off. So even though I believe everyone thinks they can't afford a wedding florist when they're seeing the images on social, there is that weeding out that some people just aren't going to call because they really are only gonna spend 400, 600, maybe $1,000 on wedding flowers, and we all know to create these high-end looks you do need more than that. So don't be too stressed about people not calling you because you're showing high-end. You will get more calls when you're showing those beautiful, well-polished images. And if you don't have those images in your portfolio, get yourself to a workshop, to a class that's going to allow you to use those images. I've seen some amazing images coming out of the Mayesh Star workshops over the years. In fact, I was looking at your schedule, and I think I need to come to Nashville with you. - That'd be awesome! Come on! - Natalie, our Creative Director is in Nashville as well. I'm like, oh, field trip, I'll go visit. There really some beautiful, beautiful images, and be able to build your portfolio is so important. And honestly, on an investment side, it's usually more beneficial to attend a workshop where you have hundreds or even thousands of flowers that you can play with, and photograph, and interact with as opposed to trying to buy those and figuring how to do it at home. - Yeah. And just talking about the workshops, I know you guys do it the same way, but we bring the best of the best to our workshops. And we have an amazing photographer that we work with. And you get a whole portfolio of your work. You'll get whatever large installation is done. And I love that idea of being able, instead of like doing a kind of style type of shoot where you're investing a lot in that, and it's just for the pictures, really, investing in the education to do that. I think that's a wonderful tip. I didn't even really think about that, you know? - I first noticed it when we were on this tour last year, and I started seeing people that were signing up for not one, or two, but three tour stops. I think one person came to like five different tour stops. - And I had to ask. After the third time this designer came, I said, well, what is this bringing you back? I am teaching the same things in every single state, with just a different color palette. And she said to me, she's like, Sarah, she said, it makes more sense for me to come here multiple times. You're gonna show me how to do and make it look right. You have the photographers on hand, and I'm building my portfolio. She was a third-year florist I believe that she just didn't have the portfolio she wanted yet, and this helped her build her portfolio. And I thought, that's genius! Why didn't I think of that when I was building? - Yeah, it is genius. It's amazing. And we do say, like, oh, you get these to add to your portfolio, but I don't, I didn't ever think back to be like yeah, this is how you can build your business, too. - Just adding some pretty pictures. Yeah, very cool. What else? What else do you have? Anything else you wanted to talk about, marketing strategy-wise? - All right, so some of the easiest things to do when it comes to marketing, is first, just figure out what the visual is you wanna share. And pull those images together. If you don't have images, like I said, get out to a workshop to build that portfolio. But start just pulling your images. Reaching out to those photographers to get images, reaching out to your brides to get images. If you absolutely have zero in your portfolio, just pick up some flowers, make some things, and start photographing them. And then I have one simple tip that is going to change everybody's world right now. Are you ready? - So video right now is stronger than photo is when it comes to social media. So Mark Zuckerberg and his big world of everything Facebook, Instagram marketing, he has deemed, I don't know if he personally deemed or his team deemed, but he has deemed that the videos will be shown more than the photos. So even on my own feed, I could put a beautiful photo out there and it would get 1,000 likes, or 2,000 likes. And I get zero following, and very little interaction. On that same avenue, I put a time-lapse video on, and if you don't know time-lapse, it's like that speedy video, right? - I put a time-lapse video on, and I can see growth of 100, 200, 500 followers from a good time-lapse video. So here is what's gonna change everyone's lives. I want everyone to set up their phone. Do it today, in your design studios. Oh, it's Monday, we're gonna have flowers. All right, so I sometimes, in the wedding world, in the wedding world, oh, it's Tuesday. I don't even know what day of the week it is. Well, in the wedding world, we don't have flowers every week. For those of you that have flowers, I want you to take out your cell phone. There is a time-lapse, or a hyper-lapse option on both iPhones and on Droid. And I want you, maybe for the next week, just record quick time-lapses of you doing your work as you're doing it. So you're going to be designing anyway. - Do a video, and start putting those on your feed, and see how they're working. And if for any reason you don't see it working, or you don't understand, I invite you to personally send me a DM. You can ask me and I will answer you. If for any reason I don't answer within 24 hours, it's 'cause I got a lot of DMs, feel free to send me another one to make sure I didn't miss it. But I'm happy to help anyone to figure out that rhythm on the videos. It has been so powerful. And I don't have any like, virtual content I can share. I don't have any lessons on this that I can share with everyone. So I give you myself. Feel free to ask me whatever you wanna ask. And I will answer for the time-lapse videos. - Yeah, I love it. Video's so huge, and you are an inspiration. Like, when I was looking through your feeds and things like that, I feel like we gotta step up our video game. Like, I need more videos, more videos! - What? Yvonne is saying that to me? - Yeah. Video is huge. And I've been talking about video for a while. I think it's so important. It is a little nerve-racking, I think, for the designers who might not wanna get in front of a camera and talk. But I like the time-lapse idea because you don't really have to be talking. You can just put a cool song on it, and there you go. - And if you don't wanna show your face in the beginning, it's okay. I recommend you show your face, but if you don't want to, just cut it down. - So Yvonne, I just had this random memory, this is totally off-script, but do you know what the first video I ever made was? The first floral video I ever made? I bet you can guess. - I have the worst memory in the world, especially when I'm on live video. - All right, so the reason I'm saying I bet you could guess is because the first floral video I ever made was for a dish that I did for the Mayesh Design Star years ago. Isn't that so funny? - That is crazy, crazy. - So that's kind of what tapped me into the whole world of videos. Like, oh that was fun, let's do it again, and again, and again, and then here I am. - I love it. Right, full circle. That's so cool. - If everyone's wondering, no, I did not win. - Well, I am grateful for that bit of inspiration, 'cause it launched me into something I didn't even know I was gonna be good at. So thank you. - Yeah, you're welcome. And you are, you're very good at it. So we have a lot of questions, I think. I've been trying to kind of keep up a little bit and still pay attention to what you're saying. But we had one that got sent in early from Instagram. It's Floral Designs Maui. And they said, they would love to watch live, but six a.m. is a little too early for us Hawaiian folks. - Yeah, so they're gonna watch the replay. By the way, I saw someone asking about a replay and if it's in the email or anything other than Facebook? And yes, let me answer that question really quick. The replay will always be on Facebook. We also upload it to YouTube. You just need to give me a little bit of time. And then I turn it into a podcast. And then you'll be able to find all of that on our website, Mayesh.com on the blog, and if you're subscribed to our email notifications, you'll get an email of our blog post once it goes live. If you aren't subscribed to our blog, you're just in our email database, that's okay, too, it'll be included in our newsletter. But I try not to bombard everyone with a bazillion emails, but it will be up everywhere, and we will post about it on social media. So I hope that answers that question. So sorry, I need to go back to the question from Floral Designs Maui. So one question is, "How do we begin "to evolve our company into a different design category? "In other words, say we're known "for doing a particular style, "we would also like to move towards "the bespoke gardeny style that is growing is floristry. "What are some ways that we can begin "to promote that to our clients and coordinators "that we work with?" - Oh, I love this question. And I have the answer. First is, just start a rebrand for yourself. Look at everything. Look at your logo, look at your fonts, look at your website. Does that speak to that bespoke audience that you wanna talk to? And if the answer is no, you have some work to do. And I'm betting because you're asking this question, that the answer is no. So what you're gonna do is you're going to create a look that you know is going to work. Do we ever know? That you believe and you feel strongly that you would be attracted to if you were looking for this bespoke gardening designer? And then, you wanna look at all of your ad spaces, even your free ad spaces, whether it be Wedding Wire, Knot, My Wedding, Perfect Wedding Guide, there's so many of them out there. And you wanna make sure the imagery that you're sharing, the part of your social footprint is on those ads, right? You wanna make sure those images are all connected to that bespoke garden essence that you want to attract. So everywhere that individuals are looking they're going to see this. But then there's one step further than you're gonna need to take. Because you have already built your brand where you are, that is something different than you wanna build it into. So you need to do some networking. I'm talking old school, pounding the pavement, going and visit, make some arrangements. Make sure you photograph them and get your social media first, and then bring them to these venues, bring them to those bridal shops. These ones you already have these great relationships with, and say we're starting to promote this new direction, these new designs, get them excited about what you are doing that is new. - I love it. Perfect answer. - So Penny wanted to point our your turning a rose into a peony video. She says, "Wow." - Oh, thanks, Penny. I did not make that up. Someone taught me that. And I wish I could tell you who taught me those. I've been doing this for years, and years, and years, and I originally started doing it because now it's pretty easy to get a garden rose that looks like a peony. But I don't feel like we had as many options 10 years ago. So 10 years ago, I was learning all kinds of ways to MacGyver flowers. It's funny I say MacGyver now, but I realize that half the audience doesn't know who that is. - Those of you who don't know MacGyver, like he makes these cool things out of things that aren't things. And he alwaysat the end. But that's not flowery. So I will deconstruct and reconstruct flowers, and I feel like I've gotten to the point where I can make almost anything. There's that one that everyone does is making the anemone out of the lisianthus. There is, gosh, I can't even think of anything beyond that. But there's so many different flowers that if you can't get them, you can create them, or give those essence by pulling other elements of flowers together. And as a wedding designer, I never tell my clients no. The answer is always yes. You want peony off-season, the answer is always yes. You want anemone off-season, the answer is always yes. Now, I'm pretty good at finding them growing somewhere in the world, even if I have to buy a plane ticket to get that bunch of flowers on the plane and have it shipped. But if I can't, or maybe Customs takes that bunch of flowers, then in most cases, I'm gonna have to MacGyver something, right? I'm gonna have to figure out a way. So that video, it was the first time I shared it in probably a couple years. But there's a time-lapse video, and I can even give it to you if you wanna share it. - But it's a time-lapse video that just shows you, okay, I have this rose. I think we used a Sahara rose, and just turned it into what looked like a peony. - I love it. Yeah, very, very cool. And that reminds me, we did like a blog post, I don't even know if it's still up on our blog, 'cause it's old, but we called it Fr-anemone, 'cause the enemies and anemones and enemy and everyone loves it. So we called it Freemen, but it was flower hack on how to turn, I don't know if it was like a lisi, or some other kind of flower into, and using like a eryngium, and making it look like an anemone. - A white anemone with a black center. So yeah, I love those kinds of things. That's very fun. - Now, anemones, I feel like this year, have changed. I don't know what's happening with the farms, or the shipping, but where I used to struggle so much with anemone, I don't know if you've noticed that, anemone this year have been stunning. Like, great quality, opening beautifully, better than I've ever seen them before. - Yeah, yeah, I don't see too many people asking a ton of questions about them. That's the only way that I can gauge it. 'Cause unlike you, I don't touch live flowers too often. But yeah, yeah, yeah, yeah. I can see that, that's very cool. Good to know. It's amazing how products evolve and change over time. All right, so I have Terrie Hall here, and she wants to know the name of Sarah's business. But you have businesses. - You wanna explain that? - Look up under the word Intrigue. Whenever Intrigue is attached to flowers, it's probably me. We started with Intrigue Designs. Then we grew into Intrigue Teaches, where we started sharing and educating through classes. And that led us to the Intrigue Experience Conference, which is definitely the biggest, and most elaborate of any of the events that we produce. So those are really the three main things, was Intrigue Designs, Intrigue Teaches, and Intrigue Experience. - That being said, there are other Intrigue things floating around that I'm also attached to. - I love it. Let's, do, do, do, do, do. Okay, here, here's a good one I think. Lori wants to know, do you use veronica? I love the beautiful blue, purple colors. - I do use veronica. In fact, when we were on the tour this year, I believe we were in Kansas City. And maybe I'll post to my story. Yeah, I'll post to my Instagram story today, I had this big bunch of veronica that I have never seen veronica like this. It was thicker than usual, it was long, it was so healthy and so beautiful. Yes, I do use veronica. And my favorite palette to play with is actually the blue tones, but I very rarely do the blue tones, because I find blues don't play as well in marketing as my peaches, and my pinks, and my ivories, and my creams, and my corals. - Yes, I agree with you, honestly. Because even when we post pictures, I could post tons of peach and coraly, and blush-colored anything, and everyone's gonna be like drooling over it, and going insane. And then you post a really cool something or another that's any other color, including blue, and it's like, wah, wah. - We say the same thing. - Yeah, wah, wah. It's so funny to me. It's so true, though. All right, here is, oh, you'll like this one. Ann says, "Love your tips. "By the way, Sarah, your hair looks great!" - Thanks! You know it's straight today. I usually curl it. I think I might like the straight look, I don't know. Thanks, guys, appreciate it. - All right, and then I have Ranee here, and she says "How does one get an awesome photographer "to take pictures of one's high-end floral design "without it costing an astronomical fee?" Do you have any tips there? - Okay, so first, it's totally okay to pay your photographers. If they want flowers from us, we're gonna pay them, right? Or we're gonna want them to pay us, rather, if we're gonna design for them. So don't stress about investing in your photographers. I do say that when you can do some trade that's definitely helpful. I know personally, I do a lot of work with Styled Shoots Across America, which this year I'm not doing quite as much, not 'cause we're fighting. I just want everyone to know, I love Heather at Styled Shoots Across America. Just 'cause I'm not traveling as much this year. So there are some amazing opportunities to get involved with Styled Shoots Across America, and Heather who runs that movement, she actually pulls right out of the Intrigue Teaches Facebook group, and she'll announce when she's got opportunities right in that group. The great thing about that is, when you design for these shoots that are done through Styled Shoots Across America, I've said that too many times, when you design for these, there are 10 photographers, 15 photographers, sometimes 20 photographers all capturing your images. Which means you have all those different eyes. And all those eyes are different artists, right? So they're seeing your images differently. So that's definitely a great way, is getting involved in these shoots and of multiple photographers. When it comes to getting images of your actual wedding work, this is a long answer again, Yvonne, so stop me if you need to. - No, no, it's a complicated question. It has a lot of different variables. I like it, keep on going, we got time. - Awesome, awesome. So when you wanna get images from photographers of your live wedding work, which I know a lot of us do, you really need to start building that relationship before the wedding. So don't just shoot an email off that day, and be like, hey, Bob Brian Photography, I'm gonna need images of my work, okay? 'Cause that sounds aggressive, and like you're telling me what you want. Like you should pay me, it just feels weird. But if instead, you start as soon as you figure out who the photographer is, and I ask my brides who their photographer is. As soon as you have that name and that information, start building that relationship. Reach out to them. Hey, Bob Brian, I'm really excited we're gonna be working on Yvonne's wedding on June 6th, and I'm excited to see the way you photograph my flowers. And then if you're doing something interesting, maybe you're doing an installation, or maybe you're doing a beautiful, like, Intrigue-style bouquet, tell them about that. Oh, the bouquet is going to be just really unique and different for this bride. It's gonna absolutely photograph beautifully. Start that conversation. Start talking to them so that they know you're excited about their work. And the same thing on social. So here's a little tip that I actually don't share very often. I guess I'm about to share this. So I have a piece of paper. This is not the paper, but I have a piece of paper, and I will write a list of all the individuals I wanna interact with each week, so when I have weddings come up, I make sure that every week leading up to that wedding, I'm interacting on their social media. It means I'm liking, commenting their pictures, I'm becoming part of their social circle, right? So that when it comes time for the wedding, they're excited to share those images with me. Now, if you're thinking that's a lot of work to get some free images, you're right, it is. The other option is, pay the fee, and get your images for the cost. And honestly, sometimes, I don't have time, and it's just worth it to me to pay the fee. I don't feel like most photographers charge an astronomical fee. Most of them do charge a pretty standard fee, and they want a couple hundred dollars and that's it. The other thing you can do is, you can bring a photographer on staff with you, here at Intrigue we have Clear Sky Images, who just happens to also be my daughter. So we had her go and take classes and learn how to photograph. And then it took her about six months to a year to really start photographing flowers the way we wanted to see them. But that was really helpful, because now I'm able to travel with a photographer that can shoot images that are right away ready for me to share on social and share in my portfolio. - Yeah, I love it. That all sounds amazing. Yeah, no, I think building those relationships with the photographers is super key. And also not have the expectation that you're always going to get them free. And think of it not as an expense, but as an investment in your future events that you want to be attracting. - So now that we have our photography from all of our different workshops and things, it's like literally changed our lives. It's one of the reasons why you're able to like have branded everything, and have a cohesive look. And that has been key. So I can't even say how much it's changed our lives having all of those photographs. It's very, very important. All right. I feel like there's a lot of questions. I haven't scrolled all the way through, so we're working our way. - I am all yours. - "Cafe au lait dahlias for summer weddings. "How can you keep them fresh?" - Sorry. I was distracted looking at like the pictures pop up. - Can you read that again? - Isn't that fun? Okay. - Yeah, LeLe Floral says, "All my brides want "Cafe au lait dahlias for summer weddings. "How can we keep them fresh?" - Okay, so I'm now talking the wholesaler, and I wanna make sure I answer this well. I'm gonna give you my honest answer, and I may get in trouble. Here's the thing, guys. I can't keep them fresh. I can't keep them alive. I look at cafe au lait, and they're beautiful for about four hours, and then they decide they do not wanna be designed by me. So I don't have a great answer for you. Cafe au lait is my one struggle. The only time I've been able to get them to work well for me, I felt like was pure luck. So Yvonne, do you have a better answer for that? - This is one I wish I had Dave and Shelley on the show with me, because this is their expertise. What I can tell you is that we have a flower care guide. I'm bringing it up just to double check on what is in here. I'll share the link for it, of course. And I do have a dahlia section on here. - So let me just share that real quick, I have a bunch of windows open now. Just give me a second, so that way I don't end the broadcast by accident like I've done before. So if you go to info.mayesh.com, and then it's flower-care-guide. So go to there, it's a little form that you fill out, and then you can download our guide. And let me just bring that back up so I can read to you what it says. So I do know enough from doing the shows with Dave and Shelley, that like, the taking care of your flowers and processing them properly is key and huge to pretty much everything. So in our flower guide it says, using a hydrating solution intended for bulb flowers from your favorite brand, whatever that is, is very, very important. Make sure that you pre-cool your floral solution and flowers to the same temperature. Make sure that you remove all foliage from under the water line, and then cut your stems at an angle with a sharp, clean knife. And then it says, cut the dahlia stems, bleed proteins, amino acids, sugars and minerals, which are a breeding ground for bacteria. I don't really know what that means. Cut dahlia stems that bleed-- Yeah, does that make sense to anyone? Not a flower person, I don't know. I'll have to ask Dave and Shelley. - I have an idea. This is kinda from April's phone, but when it is dahlia season again, why don't we work together, Yvonne, and I can do some fun videos about how to keep it alive, and I will figure it out myself as we are doing this. Because, honestly, this is an area that I need some more education, too, because I can keep any flower alive for long periods of time, except for the cafe au laits that I love so much. - Yeah. They also said here, the hydrating solution needs to be changed more often with this flower as well to prolong the vase life. So if you guys are using hydrating solution, which I have feeling a lot of the wedding and event people do not. Do you, Sarah? - I have my favorite brands, I like my cross brands, and I definitely use solutions for everything. But I don't change it regularly. So that could be part of it. - And it also could be anything. - Yeah, yeah, it needs to be changed often, and then to store the dahlias, you should be storing them at 40 to 44 degrees. So that is the other piece of it. Can't be too cold, and it can't be hot. - Well, that also could be the challenge I run into, because I'm a cool bot user. And the cool bots, they'll say that they hover around 40, 45-ish, but they really don't. They're more like a 50, 55 range. So that could also be part of it. - That's as cold as we get. - Yep, yep, so we'll put the link in the comments as well, so that way you guys can check it out. And of course I'll include it in our show notes. And that way, you guys will have it there as well. But it goes over a lot of the different problem flowers that we hear about on our show, pretty much every month. So we talk about anemones and clematis, callas, dahlias, and gardenias, gloriosa lilies, 'cause those are some finicky flowers sometimes. - Hellabores. And literally every single month I get at least a couple questions about hydrangea. It's crazy to me. We talk about hydrangea constantly. Lily of the valley, peonies, phalaenopsis, roses, and stephanotis. So those are all in this amazing guide. And then of course there's a kind of a general care and tips for handling. - Well I'm glad you guys asked me a question I had no idea to answer. - Yeah, yeah. No, it's okay. There are some troublesome flowers out there. And so I just feel like the theme to everyone's answers, like Dave and Shelley's is all about the care and handling at the beginning, using the right types of solutions. Different flowers need different types of solutions, and just kind of knowing those and how they're supposed to be handled. Again, it's a whole other learning process that, again, I'm not very familiar with either, myself. But it's all good. We're all here learning together. All right, next question is from Krisanna. She says, "How can I get the blue apron "on your site, Sarah? "The blue offered doesn't seem like the same pattern "you are wearing, and I want that bright blue!" - The blue was the very first to go. It is no longer available. However, I do happen to have the blue apron that was used in those promo photos, so if you would like it, send me a message, and I will make sure you get that particular one, and I will even sign it for you. - Aww, I love it. - There's only one, so if anyone else wants it, you're out of luck. - Very cool. Thanks, Sarah. And thank you, Krisanna. All right, next question is from Cecilia. She says, "Do you have a recommendation "for a tripod to hold your phone when you record videos?" - Yes, can I step off camera for a minute and get it? - Yeah, yeah, and I have mine, too, that I love, that I wanna show everyone, too. - Awesome, I'll be back in a hot second, 'cause it's right here. - Okay. Yeah, while Sarah is grabbing hers, I do, so when I did the quick Instagram today I did not use anything, 'cause literally I was on for 30 seconds. But I have this really cool one that clips onto my desk. And then it has a USB that can plug into my computer. And it has a little round light that will sit behind the phone. So it holds the phone, it has a little light, and it makes everything really bright. There's also some other cool, like smaller tripods that you can just hold, and it helps just having your phone on anything. I have one that like kind of looks like a gun almost, that you can kind of clip the phone too as well. So if you need to walk around, it makes everything more smooth. Sarah, do you have your tripod? - No, they were filming on Friday and it's set up on stubble. So I don't have it. I forgot it's not with me. - Do you wanna describe what kind it is, and I'm gonna go grab mine real quick. Just hold on, it's right behind me. - Yeah, so what I use is, I believe it's called a Gorilla. I have to double check that. But it is a tripod that has little, bendy, like octopus arms that you can bend around, I bend it around tree limbs, I bend it around lamp posts, so that you can attach it pretty much anywhere. And for me, personally, I like the angle that shoots down, 'cause I look skinnier, so I like to angle mine up higher, and allow it to shoot down. I also use it when I'm doing selfies or when I'm doing, like those big bunch pictures that I take, I don't know if you guys saw the ones I did on the farm last week. They were insane. I will actually attach that tripod with these little, bendy arms to anything I can attach it to, so that it's just in close enough area that I can reach around with one arm and hit the button as I'm holding my big bunches. - Yeah, that's very cool. - I can share a link with you. And they're not expensive. They're like $14. I can share a link with you exactly what I use. - Yeah, that's very cool. And so here's the one, 'cause I do work in an office setting. I'm not like, walking around. So here's the light that I was telling you about. And then it has a clip as well. And it bends kind of like what Sarah was talking about, and then it clips. I'm trying to get it right in front. And then it clips to the desk. So I clip it down on my desk, I have the little light, and then the phone, and then I have to adjust my chair basically. And there's a USB that just plugs into the computer and the light works. So it's pretty cool if you're gonna use it in the office setting, or like in your shop, or things like that. But definitely what Sarah's talking about seems like more versatile if you're like walking around, or wanting to use it at events and things like that. - Yeah, yours is way different than mine. I will say that mine is also super, super hardy. Because like I've dropped it in a bucket and take it out and shaken it off. I've attached it to like fun flowers. - It's definitely like, yours is definitely more for an office. The one I have is definitely more for like wherever you are in the world. - Yeah. No, but I like those ones that have like the bendy arms. And so I remember being at one of my first conferences and I saw like a dude with his phone attached to like this tripod, and he had it bent so it was like over his shoulders, and he was just like walking around with it. So yeah, you can use it all different ways, and they're just so versatile. And I do recommend using some sort of tripod whatever you're doing. Whether it's taking pictures and videos. It just really helps up your quality, and make it look more professional, honestly. - Yeah, also there is another unit that I've tried using, but I need it to be less complicated. But it creates really beautiful video. Makes very smooth video. It's called a Smooth-Q. The Smooth-Q, it's like this apparatus you attach your phone to, and it gives you those really smooth, like cinematic movements. It is wonderful. I never use it, though, because it's like an extra step, and clearly I need it to be super simple. - Yeah, yeah, yeah. I've always wanted to get one of those, too. I just haven't yet. - Well, I'll send you mine. It's been used three times. It's all yours. - And the camera just follows you around without you having to move it. - Which is really, really cool. Yeah, yeah, it's pretty amazing. So one day. - Look at that, we're turning into techies. - I know. I am a nerd! - I am too, so we get along. - Yeah. Big, big nerd. Well, I'll try and take a couple more questions, and then we're gonna have to wrap it up, 'cause it's almost noon, I cannot believe it. Roxanne says, "Is the rose to peony video "an example of a time-lapse?" - Yes, sort of. That was an actual video, it's an actual video that you can download on our Intrigue Teaches site, that we just sped up. So it was a professional-grade video, that we just sped up. But yes, it is a demo of time-lapse. If you go back a few, I don't know how far back, but you'll see where it's more basic. The lighting's not perfect, and I'm just creating a design really, really fast. And in fact, I can share, I will share a basic time-lapse, a really easy time-lapse today on my feed, so you can see an updated version of what that is, and again, if you have any questions, feel free to ask on my feed. - Very cool. I have a question from John Campbell. Might be in relation to Sarah Campbell, I'm not sure. - I love all the Campbells. Hi, John! - It says, "Hi, Sarah! "What was the moment that made you finally switch "from planning to floral designing? "As a planner who is quickly gaining a passion for florals, "this is something I've been weighing lately. "I'd love your insight." - Okay, so what made the switch? The story is actually long. It might need its own session just to tell the actual story. It's also a very good story over a glass of wine or two. But really came down to knowing that, yes, I can do wedding planning. But the reality was I didn't care if the bride made it to the church on time, if they had any food at the hall. I just wanted it to look beautiful. And when I realized that not only did I have the ability, that I could create these beautiful things, but also that's where my priorities lied, you will always be more successful when you follow what is in your heart, when you follow your priorities. So because I always cared how beautiful everything was, and creating that environment, that's something that you really can control as a florist, as an event designer. That isn't something you have as much control over as a planner. A planner, some planners do design as well, but for the most part, most of the successful planners I see, they are primarily more on the logistics and the visual inspiration side, and not physically creating. So I also found that for me, I sold better when I was selling design than when I was selling planning. So opposed to seeling like a service, that, or selling a, music. - Now, I'm selling a physical creation. I'm selling something tangible. I found that the money was significantly better when I jumped into florals. And specifically into those large-scale wedding florals than it was when I was doing solely planning. And I say it over and over again, I'm a business person, a businesswoman first, business individual first, whatever you wanna call it. And I am a florist second. Because you first have to make sure you are running a sustainable, powerful business in order to do what you love. So look at the dollars. And I feel like sometimes in our industry it's not popular to say that, it's not popular to say I'm designing because I wanna make a profit. But at the end of the day, why are we working so hard, if not to build a profit? If we are a hobbyist, that's totally fine, you can be a hobbyist. But that's not my game. I'm in the floral business to build a life, and build income and revenue for my family. And there's far more revenue in flowers than there was in planning for me. - Love it, cheers to that. We are coming to the end. And so before everyone leaves, I thought we should talk about Intrigue Experience a little bit, and the special that you have for everyone. Hopefully you all have hung in there for this. - Last year I was on tour all year. Normally we launch this conference a year out. I really didn't have the time to put into the launch until January, once the tour ended, so we launched a conference two and a half, three months out, and I was shocked at the response we received. But I have something. I actually saved two of the seats. - So, I saved two of the seats just for us today, just for you and your customers at Mayesh. So only for your customers. We're not do this anywhere else. I have two seats. They're available for the first two individuals. The site will very much still say sold out. I'm not changing the site. You enter code Mayesh. And you will be able to have access to those seats. Not only that, you have access to it at the presale rate. So it is, I believe $1,000 below what is on there right now. So we only have two of those. So the first two of you to get to the Intrigue Experience site and put your order in, using that code, Mayesh, will have those two seats. - Awesome. Thank you so much, Sarah. - You're welcome. It was kind of exciting. I can't wait to see who the two people are. - I know. If you guys are the two people, make sure you let us know. 'Cause we wanna maybe follow you guys around. I wanna hear about everything. You guys can be our insiders, our Mayesh insiders. - Yvonne right now, she's like, wait a minute, I'm getting that seat before anyone else. - Yeah, hold on real quick. Awesome. Well, Sarah, this has been amazing. I have a whole bunch of other questions, so I think we'll be able to work together and get those answered, and I can add them to the blog, I'm sure. - So if you all, yeah, I know. You're amazing like that. So if you guys give me, us just a little bit of time, we'll get those up on the blog show notes as well for you all. Anyone that's also sent in questions that we didn't have time to get to. So Sarah, you've been an amazing guest. Thank you so much for sharing everything, all your tips and marketing strategies. It was great. And as always, I love seeing your smiling face. So thank you so much. - Thank you. Bye, guys! - All right, have a great day. Bye, Sarah. All right, guys. I hope you enjoyed that as much as I did. That was awesome. Sarah is amazing. So much passion, and so much joy in what she does, right? You can just feel it from her. And that's probably one of the most things that I love about her. And so that's a wrap. 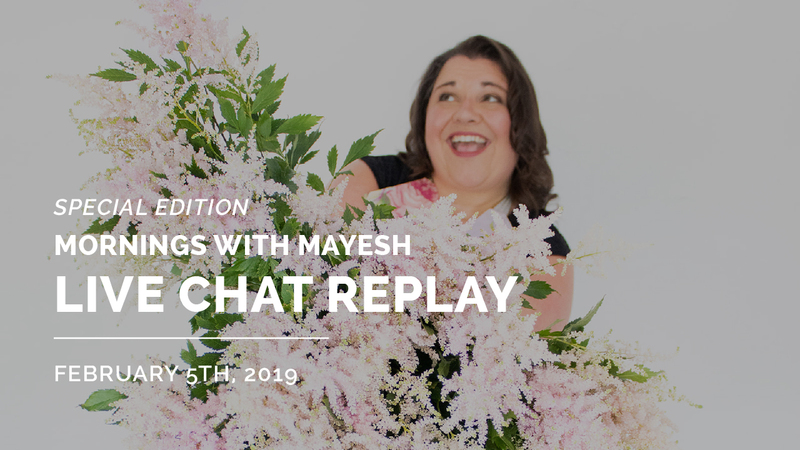 A wrap on February 5th Mornings with Mayesh. I hope to see you guys. If you guys have more questions for Sarah, go ahead and put those in the comments now. In a couple of hours I'm gonna go through those and get those off to her and her team, that way we can answer them for you, and add them to our show notes on the blog post for this show. That'll be up in a day or two. Give us a little bit of time. Our next show, as I mentioned in the beginning, is scheduled for February 19th, after Valentine's Day. So on behalf of our Mayesh family, we wish you a very successful Valentine's Day. And we hope that it is full of love, and full of successful business. Thank you for joining us, and I will see you soon. Have a rocking day. Bye guys!